When it comes to premium tequila, there’s no brand more dominant than Patron. 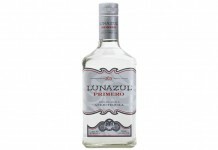 The brand singlehandedly revolutionized the tequila segment, converting American drinkers from cheap, fiery mixto tequila to premium tequila made from 100% agave. Now, with literally hundreds of offerings in the premium tequila space, it’s hard to imagine a time when a liquor store might carry just a handful of brands. In the intervening years, Patron has expanded their offerings through innovation. At the lower end they’ve introduced a line of tequila-based coffee and chocolate liqueurs under the Patron XO Cafe brand, which has been effective at attracting new drinkers to the brand. At the same time, Patron has explored the upper reaches of the ultra-premium market with their Gran Patron line, which has helped attract high end consumers in search for luxury spirits. Now Patron is gunning for (or perhaps trailblazing) a new segment of the tequila market with a new line of tequilas which will be marketed under the Roca Patron brand name. Roca, which translates from Spanish to “rock”, refers to the stone wheel (or tahona) which was traditionally used to crush cooked agave in the production of tequila. Patron payed homage to this process earlier this year with their Gran Patron Piedra ultra-premium release. Traditionally, Patron hasn’t been big on discussing how they produce their tequila. In 2010, Drink Spirits was the first to report of Patron’s Green Initiatives, one the most progressive in Mexico. 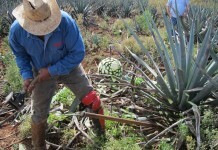 Even though they are a leader in sustainable tequila production, Patron rarely trumpets it. A spirit company being understated about how they make their products might have been fine in 2010, but with more information-hungry Millennials reaching drinking age in 2014, the marketplace has shifted and so has the demand for information. Responding to this shift, Patron has begun to more openly discuss how they make their tequila, and part of that conversation is Roca Patron. Since its inception, Patron Tequila has been made from a blend of agave that is crushed by the traditional Tahona process (which includes the agave fibers in both the fermentation and distillation) and agave which has been crushed through a roller mill (a more industrialized process where the agave fibers are not included in the fermentation and distillation). Each of these styles of crushing, fermentation, and distillation yields a tequila with distinct character. The traditional Patron tequila represents a marriage of these two styles. Roca Patron takes the tequila produced by the Tahona process and isolates it into its own product. While it may not sound very daring, it is, as Roca Patron is distinctly different in character from the traditional Patron tequila, so much so that it would be difficult to pick it out as “Patron” in a blind tasting. Roca Patron, released in bottles which closely resemble Patron’s classic line, are available in the same classic expression styles: Roca Patron Silver, Roca Patron Reposado, and Roca Patron Anejo. In addition to being 100% Tahona agave, these new Patron tequilas are all released at a higher proof than the traditional Patron tequilas (traditional Patron is 80 proof or 40% ABV, while the Roca Patron range from 84 proof or 42% ABV all the way up to 90 proof or 45% ABV). The Roca Patron line also carries a much higher price tag, starting at $69 and going all the way up to $89. Roca Patron Silver Tequila (45% ABV / 90 Proof, $69) – while a 5% increase in ABV over the traditional Patron Silver might not seem like a lot, in the spirits world it’s considerable. From the nose on the Roca Silver, you’d never guess that it’s a higher of a proof tequila as it’s actually considerably less “in your face” than the traditional Patron Silver. One of the things that makes the traditional Patron Silver so distinct is its nose, which showcases rich cooked agave, distinct citrus, and strong white pepper. Roca Patron Silver is absent of many of these signature aromas. Roca Patron Silver is primarily a showcase for agave, with both fresh and cooked agave with a slight earthy undertone. There’s a light pepper but it’s a lot softer and lighter than traditional silver. 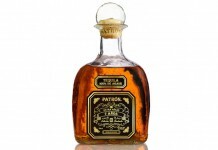 Patron’s signature citrus isn’t there on the nose, which is overall lighter and more delicate. The entry for Roca Silver is also significantly different from the traditional Patron. While there are sweet notes at the opening, including cooked agave and subtle vanilla, they are lighter and presented drier in Roca. In the midpalate, things continue to dry out with the addition of a light pepper spice and the slight earthy tone that was on the nose. A notable absence in the midpalate is Patron’s signature pepper kick – it’s simply not there. The finish for Roca Patron Silver is medium length and dry, with light pepper spice and fresh agave. After tasting Roca Silver, it’s easier to identify the qualities that the tahona produced tequila brings to the equation in Patron Silver, but when presented on its own it’s a dramatically different tequila. Roca Patron Reposado Tequila (42% ABV / 84 Proof, $79) – aged for 4-5 months in ex-bourbon barrels (the traditional is aged in a combination of ex-bourbon, French, and Hungarian Oak) and bottled at a slightly higher proof than traditional Patron Reposado (but lower than the Roca Silver). The nose on Roca Reposado has a similar restrained quality as the Roca Silver, and while there’s definite impact from the ex-bourbon barrel with caramel, vanilla, and oak, it’s much more subdued than the traditional Patron Reposado. In addition to barrel impact, there’s the cooked agave note which we saw with Roca Silver as well as a very slight peppery spice. There’s also a distinct Milk Dud note that we get from the nose which comes from a slight milk chocolate mingling with the caramel and agave. The entry for Roca Patron Reposado is much lighter than the traditional Reposado and less complex. The opening has the sweet caramel, vanilla, and agave mixed with light pepper and oak spice. In the midpalate there’s a slight ramping up of the spice along with an increase in pepper. Things never get very spicy and there’s an overall light, delicate quality to the Roca Reposado. The finish for Roca Reposado is medium length and dry with light oak and pepper lingering on the palate. We get what Patron is trying to do with Roca Reposado and the result is quite affable, but the lack of complexity which worked in Roca Silver just doesn’t seem to have the same impact with the Reposado. While we enjoyed the taste of Roca Reposado, it left us wanting more. Of the Roca line, the Roca Reposado was the most likely to disappear when mixed (although at these prices, the Roca line isn’t really ideal for mixing). Roca Patron Anejo Tequila (44% ABV / 88 proof, $89) – of all the Roca releases, the Anejo is perhaps the closest cousin to Patron’s Gran Piedra release, although Roca Anejo was aged for only 14 months (versus 3 years for Piedra) and only in ex-bourbon barrels (Piedra added French oak to the mix). With Roca Anejo the time in barrel is clear with oak spice as one of the leading top notes in the nose. Other barrel notes including caramel, vanilla, and a touch of cinnamon are here on the nose and they are well integrated with the fresh and roasted agave notes which are a signature part of the Roca line. There’s a touch of pepper spice in the mix, but it’s the oak that’s much more dominant. We expect the Roca Anejo to be the biggest hit of the three: it manages to provide an ultra-premium anejo tequila experience that’s balanced, approachable, and delicious. It’s also priced at a point where consumers aren’t unaccustomed to paying a premium (at the price, the Roca Reposado is a very tough sell). Of the three Roca offerings, the Roca Silver and Roca Anejo are the strongest. Roca Silver manages to be a good showcase for agave while Roca Anejo has the most complexity and possible appeal to the traditional Patron drinker. All three Roca’s are really too delicate and subtle to really mix with, and at the price point they aren’t the best choice for cocktails. 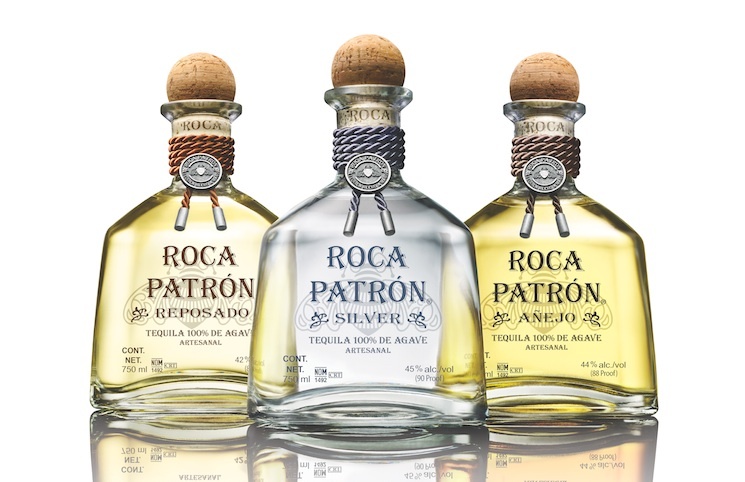 With the Roca Patron line, Patron has done something really interesting: they’ve released a line of tequilas that are completely absent of the flavor characteristics which have helped make Patron a massive success. Patron made a big bet at the start of the tequila boom that American consumers would be interested in premium 100% agave tequila. Now they’re making a measured bet that the tequila market that they’ve helped establish has grown and matured enough to support not only ultra-premium offerings, but higher end premium offers that offer a distinctly different riff on what agave can bring to the equation.